Das Keyboard introduces the 4 Root Edition mechanical keyboard offered in soft and tactile Cherry MX Brown switches and the clicky Cherry MX Blue switches. It packs the Das Keyboard 4’s superior craftsmanship and iconic design with the addition of the 2-meter braided cable. The Das Keyboard Root 4 also has a USB 2.0 hub to connect other peripherals and devices with ease. All of these features offer unmatched typing experience that can only be found on the Das Keyboard 4 family of keyboards. 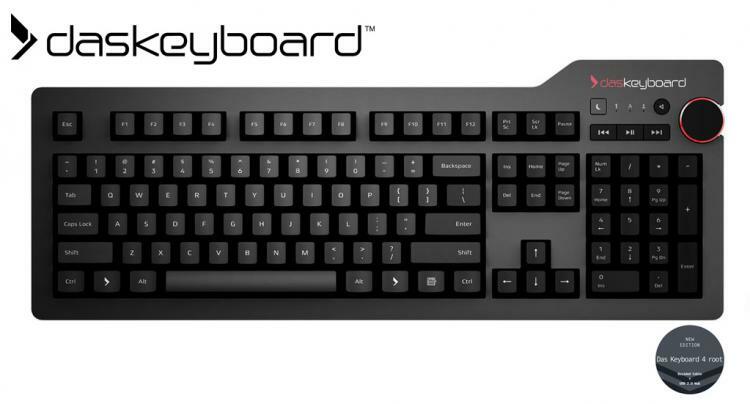 Das Keyboard uses best-in-class Cherry MX mechanical key switches that provide tactile and audible feedback with great accuracy allowing execution in lightning-fast precision. The Das Keyboard 4 root mechanical keyboard is available in both the Cherry MX Brown and Cherry MX Blue switches. Adjust volume with ease and on-the-fly with its large volume knob. The 4 Root also sports easy-to-access dedicated media controls beside the volume knob. The Das Keyboard 4 Root also has two easily-accessible USB 2.0 ports for connecting and charging devices. Das Keyboard 4 root supports full n-key rollover (NKRO) over USB. The Das Keyboard 4 Root uses laser etched key inscriptions that endures wear and tear better than double shot keycaps. Also uses a custom keycap font to aide reading. The anodized aluminium top panel improves stability and durability of the keyboard along with a premium look and feel. The Das Keyboard 4 Root’s 2-meter long braided cable completes the premium look and a tangle-free experience for a neater workspace. The Das Keyboard 4 Root Mechanical Keyboard is now available with an MSRP of $149.00 for both the Cherry MX Blue and Cherry MX Brown variants. 4 Root is covered with the 1-year warranty but expandable up to a 3-year warranty.